Organic Granular Fertilizers are products Omaha Organics uses to stimulate growth and add slow release nutrients to the soil. Our Organic Fertilizer program consists of 4 applications spaced throughout the year. The organic matter in our fertilizer feeds microorganisms in the soil, improving the foundation upon which plants grow. Healthy soil is the long term key to lawn and garden success. Without fertile soil, plants cannot thrive. The first application is granulated 9-0-0 Corn Gluten Meal or CGM. 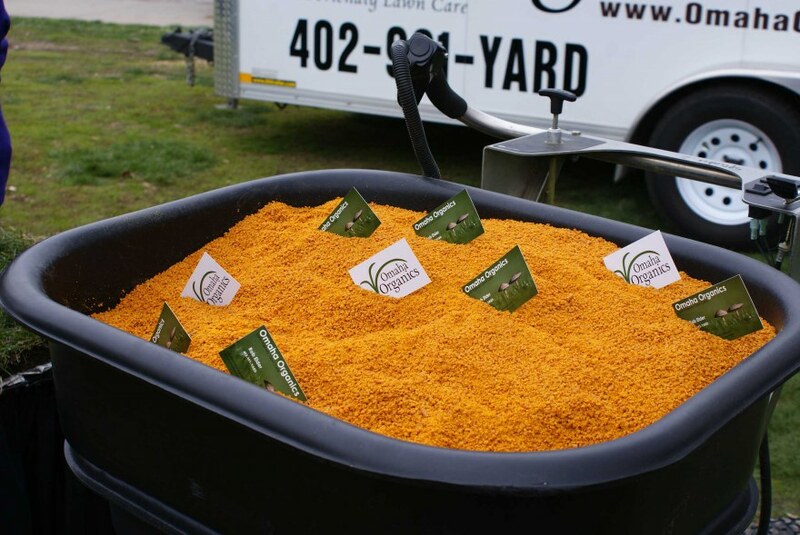 Our Corn Gluten Meal will help with dandelions and crab grass, and will help build a healthy turf foundation. This application is designed for slow release of nutrients for continuous greening, and resistance to heat, drought, and heavy foot traffic. The second application contains important Micronutrients and Amino Acids not present in synthetic fertilizers. This application promotes seed germination and root development as it nourishes poor soil. It helps grass absorb Nitrogen, Phosphorous and Potassium, encourages Chlorophyll production for intense green grass. This application also contains Kelp. The third application is a 5-1-5 natural fertilizer made exclusively of Alfalfa Meal, Soy Meal, Molasses, Kelp Meal and Sulfate of Potash. The Alfalfa Fertilizer is an excellent fertilizer providing protein and carbohydrates that encourage microbial activity in the soil. The microbial component increases the biological activity in the soil structure and provides a healthy foundation for growth. The final application (CGM) not only feeds the plant and prevents weed seeds, but also provides organic matter for the soil to break down and store for later use. This application maintains and rejuvenates the soil’s healthy foundation for healthy growth. The 4 step fertilizer program listed above is also available in a Do It Yourself program. To sign up for our organic services please contact Omaha Organics Lawn Care. class="post-template-default single single-post postid-56 single-format-standard samba_theme samba_left_nav samba_left_align samba_responsive wpb-js-composer js-comp-ver-5.0 vc_responsive"